B U B B L E G A R M: FOTN + In's & Out's! FOTN + In's & Out's! FACE: Mac Face & Body C3 with Bourjois 10hr sleep effect under my eyes and Mac Studio Finish concealer NC30. CHEEKS: Benefit Hoola, Mac Moon River mineralised blush. EYES: Mac 'Crystal Avalanche' e/s all over the lid & to highlight, 'Romp' in the crease, 'Brun' & 'Carbon' on outer corner. Shu Uemera painting liner in black on upper and lower lash line, Urban Decay 'Zero' smudged on bottom inner corner and then Mac 'Rice Paper' e/s on inner corners. Red Cherry #503 lashes and Mac zoom fast mascara. Tonging my hair and then brushing it out to create messy waves. H&M - I have been finding so many lovely things, I hauled again yesterday! Discovering REAL Maternity clothes, I found the best jean shorts that are SO comfortable. Silver metallic nails, the one I am wearing below is 'Shine' by Orly. Escada 'Taj Sunset' perfume, I love ALL Escada perfumes and this is the newest one out which is just as gorgeous as the others, it has notes of mango and passion fruit. Weird skin, my skin is great one minute then I have mountains the next. What's your In's and Out's? Love the polish! You look stunning. I'm tocking a hot fluro coral pink nail. Outs: Spots again (hormonal probably). Woops that should say rocking, not tocking!! and Quite quiet! Not quite!! Gorgeous FOTN! And I love the effect you created by brushing out your curls. I always used to wear Escada perfumes when I was younger. There's something so deliciously summery about them! You look so pretty :) and you look so cute with your belly growing! Your skin always looks super FLAWLESS. Majorly jealous here! 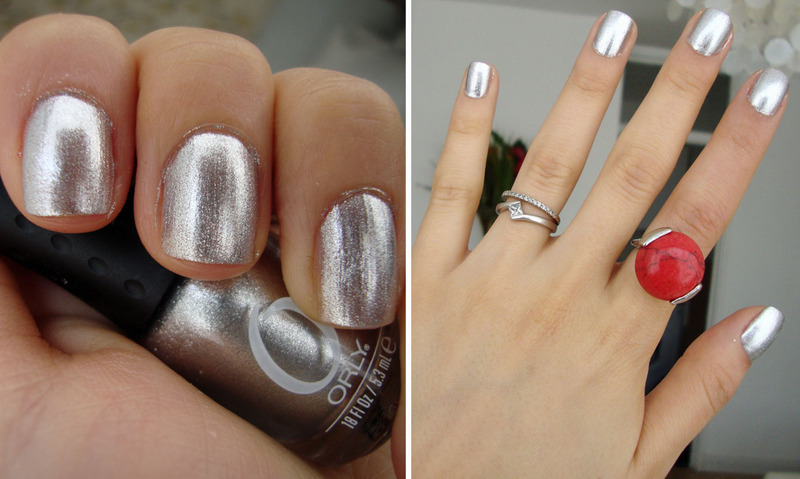 That nail polish is amazing! I love it. Oh Muhsine you look so pretty :) loved this post! Aw you look so pretty =) It's so exciting to see your baby bump grow! love your makeup and hair. You have the pregnant glowing skin! ooh, the baby's making its presence known! how exciting :). i can't get over how amazing your skin looks here! You look so beautiful!!! I'm about 11 weeks pregnant right now and in no mood to do anything at all, much less do my make up, shop, dress up, etc...because I've been feeling so awful. Please tell me it gets better! OMG I find it so funny that you mentioned the PSN thing! I read your blog because of my interest in makeup but I am also into the whole PSN thing and it's really surprising to see you blog about it lol. aww you looks so beautiful! :) hope pregnancy is treating you well! my sister gave birth to her own bundle of joy 2 weeks ago! Ah! I love Escada Perfumes too... Favourite ever was Escada Hippy... Amazing how certain scents can bring you some really good memories. Make-up looks stunning, your skin looks flawless! Loving the nail polish it really suites you. My Ins: Finally getting a tan in this weather! My Outs: Trying to grow my hair and it seems to not want to boo! your make up looks gorgeous. I know! Weird skin totally out, right? I blame my hormones and be easy, can happen whilst pregnant..
You look really good though, mashAllah! Wish you all the best! Ugh! WHY is PSN still down!?! It's supposed to be coming back tomorrow, but after more than a week, I'm super frustrated! Hopefully credit info hasn't been compromised! you look amazing! 18 weeks, and still able to fit into your regular jeans..incredible! that nail polish is gorgeous!!!! hey, you are looking pretty ! :) just wanted to give you one very early advice: try to choose your hospital as early as you can, get to know nurses and midwifes and ask them to show the delivery room, it will really relax you :) take care ! How lovely and gorgeous at the same time, Bubbles!! I can notice the sparkles in your eyes saying "a baby is coming", haha!! I am now in serious need of that amazing nail polish... I will try Ebay! love the polish and your make up! Please have a look at my new blog allskitchen.blogspot.com for delicious recipes! It would mean the world to me! You look so beautiful ! Can you do an everyday skin care routine? Thank you.Kiss from France! You look absolutely stunning! Love love your hair and make up here!! Thanks for sharing!! your skin looks amazing... Why do you mix mac f&b and bourjois? Which one would you prefer? What's your favorite summer perfume or any perfume.